Not only is the sweet potato vine a lovely trailing plant that can add beauty to any growing area, but this plant has an edible root that many people enjoy. Plant sweet potato vines in a sunny growing area when the temperatures warm in the spring to ensure these tender perennials do not suffer injury from frost. With proper gardening care throughout the growing season, sweet potato vines will thrive to produce delicious tubers to eat. Prepare the growing area two weeks prior to planting the sweet potato vines. Cultivate the soil with the garden spade at least 6 to 8 inches deep. Add 3 lbs. of the granular fertilizer evenly over every 100 square feet of garden soil and work the fertilizer into the soil thoroughly with the garden spade. Create an 8-inch-high planting ridge 1 1/2 feet wide in the planting area. If you need more than one ridge to plant more sweet potato vines, space the ridges 3 to 4 feet apart. Plant the sweet potato vines approximately one month after the final spring frost. Place the vines 1 to 1 1/2 feet apart along the ridges, setting them into the soil at the same depth as they were growing in their temporary containers. Firm the soil around the vines gently with your hands. 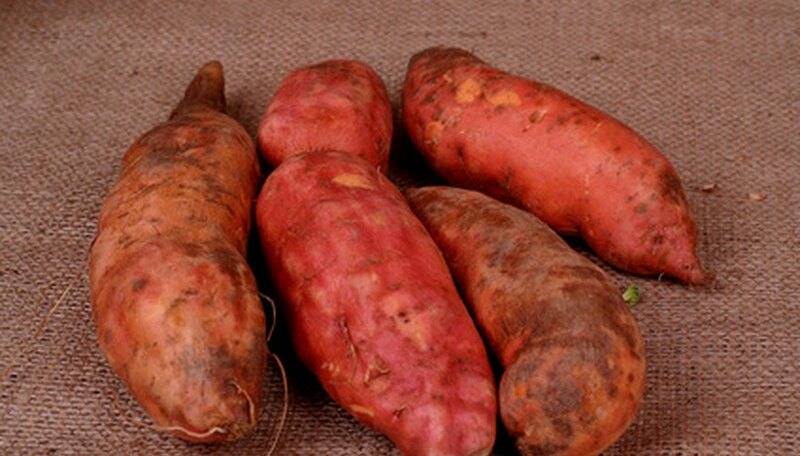 Provide water for the sweet potato vines immediately after you finish planting them to saturate the soil evenly. Make sure the sweet potato vines receive a minimum of 1 inch of water each week. Place a 2-inch layer of shredded wood chips or bark around the sweet potato vines to prevent weeds from encroaching upon the plants and to keep the soil moist.